Although Excel is a spreadsheet program, many people use it to keep and maintain database tables on an iPad. Addresses, inventories, and employee data are examples of information that typically is kept in tables. These pages explain how to create a table, format the table, and sort and filter a table to make it yield more information. Sort a table to put it in alphabetical or numeric order; filter a table to isolate the information you need. To create a table, start by entering the data. Make sure that the table has column headings to identify data. As well, consider entering row labels on the left side of the table to identify data in rows. Tap anywhere in the data you want to use for the table. Excel creates the table. Notice the drop‐down arrows on the column‐heading cells. Tapping one of these arrows displays a drop‐down menu with commands for sorting and filtering data. After you create or tap a table, the Table tab appears. It offers commands for handling tables. On the Table tab, tap the Table Styles button. A drop‐down menu with table styles appears. The Table tab offers style options as well as table styles. Tap the Styles Options button and choose options on the drop‐down list to format header rows, total rows, and the first and last column differently from the rest of the table. To remove formats from a table, tap the Table Styles button and choose the first style on the drop‐down menu. To remove a table but keep its data in the worksheet, tap the Convert To Range button on the Table tab. After you corral data into a table, you can sort and filter the information. Sorting means to rearrange the rows in a table on the basis of data in one or more columns. Sort a table on the Last Name column, for example, to arrange the table in alphabetical order by last name. Sort a table on the ZIP code column to arrange the rows in numerical order by ZIP code. Decide which column to use for sorting. At the top of the column you choose, tap the down‐arrow. The Sort & Filter drop‐down menu appears. Tap Ascending or Descending on the drop‐down menu. An ascending sort arranges data in alphabetical order, numerical order, or in order from the earliest in time to the latest in time. A descending sort arranges data from Z to A in alphabetical order; from the largest to the smallest number in numerical order; and from the latest to the earliest in time in the case of data that pertains to time. You can tell how a table has been sorted because the Sort icon appears at the top of the column that was used for sorting. The arrow on the icon indicates whether the sort is descending or ascending. Filtering means to scour a worksheet table for certain kinds of data. Excel for the iPad offers the ability to filter by exclusion. In this type of filter, you exclude data from the table. For example, to filter an address table for addresses in Boston, you designate Boston addresses as the ones you’re filtering for and exclude all other cities from the table. The result is a table with Boston addresses only. Decide which column to use for the filtering operation. You see the Sort & Filter drop‐down menu. This menu lists all data in the table column you chose, with a check mark next to each data item. Tap Select All to remove the check mark next to this option and deselect all items in the menu. 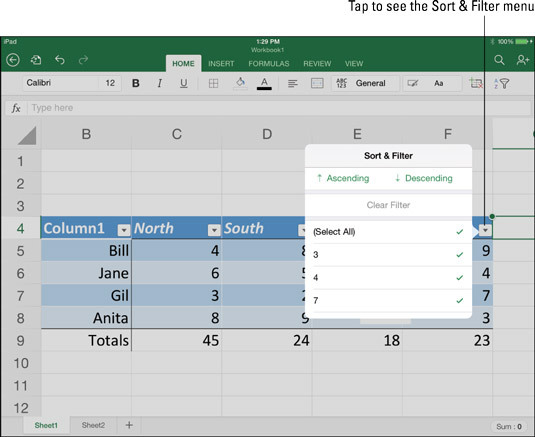 On the Sort & Filter drop‐down menu, tap each data item you want to include in the table. For example, to include only the addresses of people from Boston in the table and exclude all other people, select Boston. The table is filtered to present only the information you want. To show that a table has been filtered, the filter icon appears at the top of the column used for filtering data. To unfilter a table and make it display all its information, tap the filter icon and choose Select All on the Sort & Filter drop‐down menu.